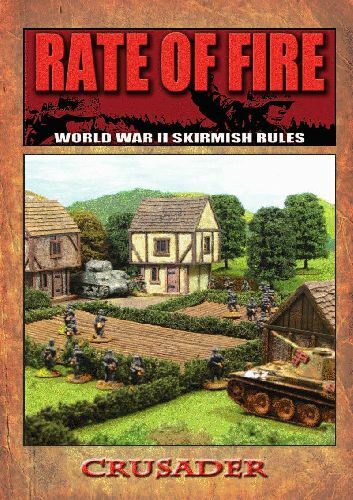 Rate of Fire are a set of WWII skirmish rules suitable for miniatures from 15mm through to 40mm. Each player can quite easily control 30-40 figures and complete a game within a few hours. The game mechanics have been designed to be fast and simple but with the emphasis on troop quality, command and morale. Suppression, force morale, opportunity fire and staggered fire phases mean that you will need to use historical tactics to achieve your goal - charge headlong against the enemy hoping for the best and you are in serious trouble! The rules deal primarily with infantry actions, as well as everything you would expect from an infantry skirmish game there are rules for smoke, artillery, direct and indirect HE fire, leader abilities and re-rolls, mines, obstacles, specialised weapons and more. Rate of Fire suitable for setting up historical scenarios or as a points based game where both sides bring along a balanced force and fight it out for victory objectives. The rule book includes 3 introductory scenarios and a comprehensive points system so that you can calculate the value of any force without having to rely on ‘official’ supplements. All of the charts, tables and counters are provided in the rule book and are also available to download from the Crusader Publishing web site. The rules cater for head to head games as well as large multi player affairs so no matter what period or theatre of WWII you are interested in Rate of Fire has it covered.